Minnesota is known for its pleasant scenery and friendly residents. Minnesotans are big on community and gathering together. For example, the Minnesota State Fair is advertised as The Great Minnesota Get-Together. 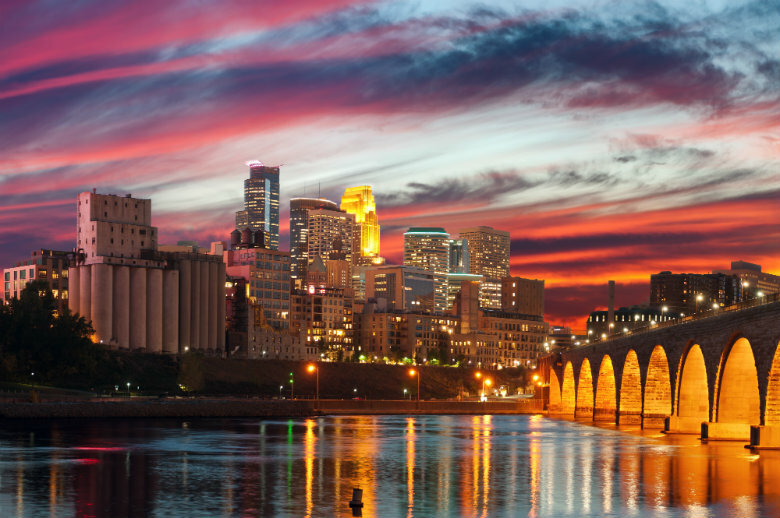 This inviting atmosphere attracts people from all over to move to and visit Minnesota. Many people enjoy raising their families in Minnesota, while many others choose to spend a significant amount of vacation time in the state. If you choose to relocate to this great state or decide to take a long vacation, consider using National Dispatch to help with your vehicle shipping needs. There are several great reasons why transporting your car is a better option than driving to your destination. By transporting your vehicle you can save money on all the added expenses of travel. If you are on vacation, rental cars can be expensive, especially for long trips. On top of the rental fee, you will have to purchase extra gas, insurance, and keep the car in perfect condition. If you are moving, you will have to factor the costs of gas, lodging, and food. By the time you add everything up, it might be smarter to just ship your vehicle. It is no secret that planning a trip or a move is stressful. There are so many details to keep track of. When it is time to go, the last thing you want to do is drive for hours on end. At National Dispatch, we can help relieve some of your stress by transporting your vehicle. You will then be able to hop on a plane and relax. Traveling long distances can put a lot of wear and tear on your car. Not only will it add hundreds, if not thousands, of miles on your tires, but you will also burn through a lot of engine fluids. It will require that you replace these fluids much faster than if you were to ship your car. The accumulation of miles is especially important for owners of classic cars. Shipping your car with National Dispatch is a much safer alternative to driving. Now that you have used National Dispatch to transport your vehicle to your new home or vacation destination, you are no doubt ready to explore. We have compiled a list of five very unique spots for you to enjoy. These five locations may not be your average travel destination, but they are still exciting. Located in the southern part of Minneapolis, the Quietest Place on Earth can drive a person mad. It sits in a lab and is an anechoic chamber. This means that there is no echo of sound, and the room absorbs 99.9% of any sound that is produced. Many large companies use the room to test the volume of their products. The lab is open to the public, but only for a short amount of supervised time. Only members of the media can stay longer. This is to help protect the mental state of all guests. While in the room, a person will adapt to the lack of noise. They will then be able to hear their heartbeat, stomach gurgle, and lungs expand. Most people leave the room in about 15 minutes, because they are disturbed by the sounds of their own body. Before you go to the Quietest Place on Earth, make sure to call ahead; tours are only available by appointment. Located in Grand Marais, Devil’s Kettle is a magnificent site. At this location, you will witness a beautiful waterfall. When the water falls, half of it goes into a river and eventually ends up in Lake Superior. The other half seemingly disappears down a hole. Once falling into the hole, nobody knows what happens to the water. Researchers have tried to locate where the water goes, but have come up short handed. They have thrown objects, such as ping pong balls, down the hole in hopes of finding them somewhere else. Learn more about Grand Marais. The Spam Museum in Austin, is dedicated to the love of canned ham. Hormel Foods has created this museum to remind the public of the wonderfulness of the ham product and to combat some of the negative stigmas surrounding canned ham. At the museum, guests will be able to view a large amount of Spam memorabilia dating back to as early as World War II. Guests will also be able to learn of the history and the importance of this product during World War II. Also on display are all of the different marketing techniques from around the world. Recipes from around the world are also able to be seen by guests. For all of the shopaholics out there, this is for you! Located in Bloomington, The Mall of America is record breaking and fun. There are 520 stores to shop at and enjoy. The Mall has four levels. There are more than four miles of store fronts, miniature golf, thrill rides, Lego people, and more. Within the mall there are several things to satisfy everyone, even if they hate shopping. Some of these attractions include a motor speedway, aquarium, dinosaurs, LEGO land, and more. One thing that visitors really love about the mall is that there is absolutely no sales tax! This art museum, located in Winona, is not your typical art museum. The purpose and mission of the museum is to engage the public with visual art experiences that explore the human relationship with water. The MMAM opened up in 2006 as a nonprofit art museum and educational center. At any given time, the museum has 10 or more exhibits. Each exhibit has the ability to defy what people believe art needs to be. There are modern and historic paintings and photos that describe what marine art is to each artist. So, you have decided that Minnesota is the place for you, and you are going to use vehicle shipping services to transport your car. Now what? Request a free, instant car shipping quote using our online quote calculator. No personal information is required. You can also call us at 800-321-2051.